Our school operates a ‘positive behaviour’ model which means our emphasis is on praise and reward for children who exemplify our values. Our expectations are high and we encourage self-discipline and taking responsibility for own actions. When children make mistakes we encourage them to reconcile the situation in an appropriate way. There are sanctions for misbehaviour and children are not allowed to disrupt lessons for others. We have strong anti-bullying and anti-racist policies. At Bowsland Green Primary School we have 5 houses. Edward Colston, Carol Vorderman, Aardman, W.G.Grace and Florence Nightingale; each house is represented by a colour. When a child joins our school they are put into a house, if they have an older sibling they will be put in the same house as them. We appoint House Captains, who have shown exemplary behaviour and are confident to speak to visitors, who keep a track of house points earned, organise activities for their House and most importantly represent the school to visitors of all kinds and during outside events. House points are rewarded when we do something outstanding, like an extra special piece of homework or a group presentation. Teachers give us house points when we demonstrate our Bowsland Best. At Bowsland Green we are working SO hard to be our BOWSLAND BEST! 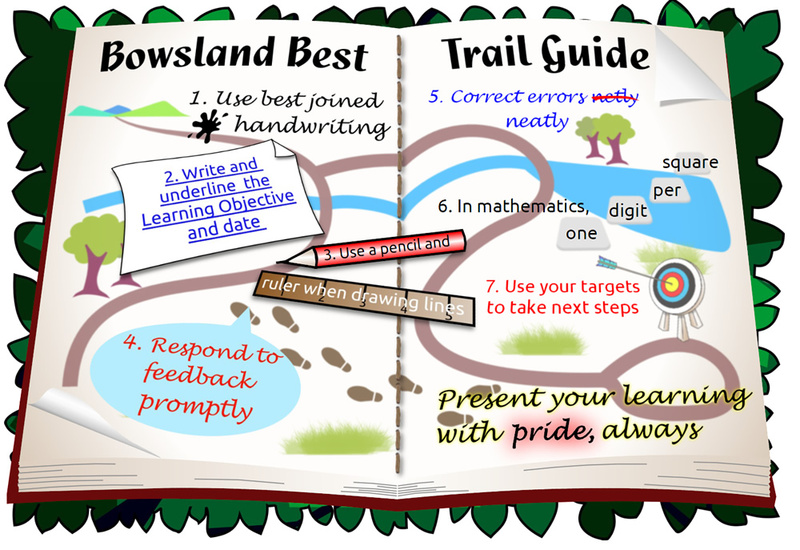 Have a look at our new ‘Bowsland Trail Guide’ which guides us through our learning and reminds us what’s important to remember in role modelling each and every day. Could you be a learning detective? 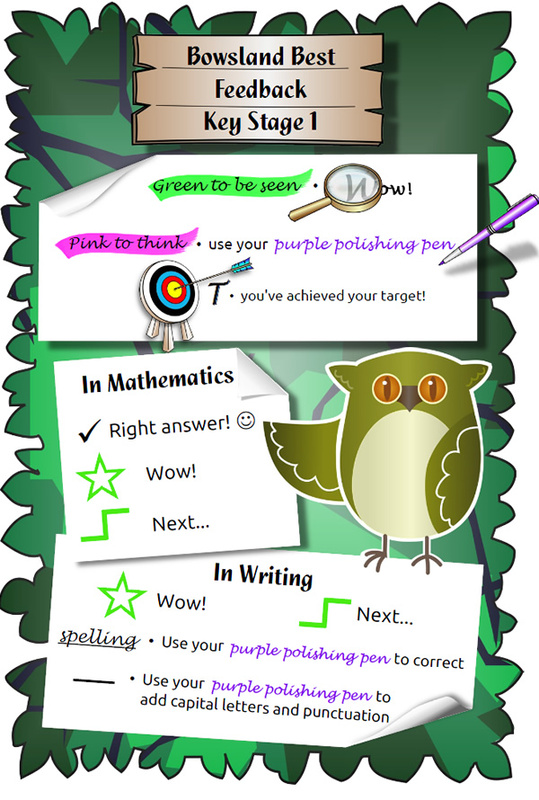 Look out for these things in our learning books! 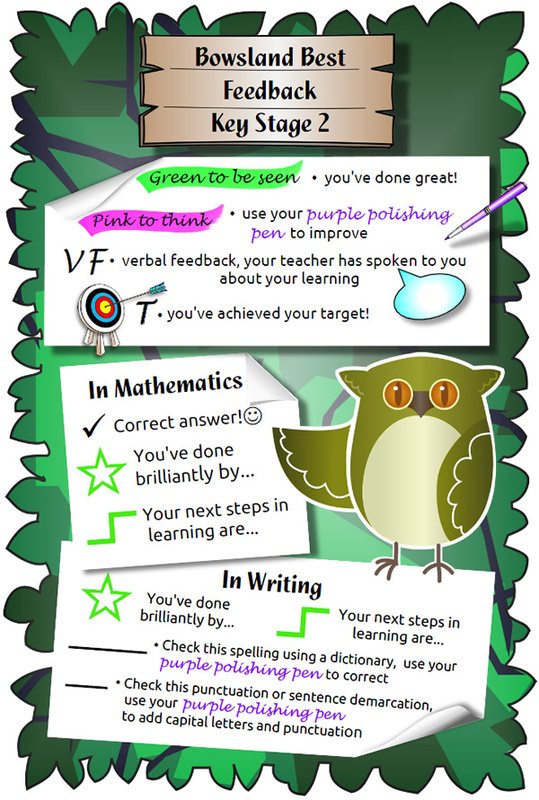 In KS1, we are proud to use our 7 ELLI learning powers to help us be successful learners. The ELLI skills (Effective Lifelong Learning Inventory) are adapting, making connections, planning, resilience, teamwork, curiosity and creativity. The display below helps us to remember each power as it reminds us of our ELLI story. The story tells us about a bear, who needs help to achieve his goal. His friend, Elli, encourages him to meet all the animals who can assist him. We realised at the end of the story that ALL the animals were needed for the the bear to be successful, and that if we want to be successful, we also will need ALL the animals! We are proud of our display because we worked together in each class as ‘bees’ to create each important animal in the story, and then took turns to present each animal to the rest of the school in assembly. 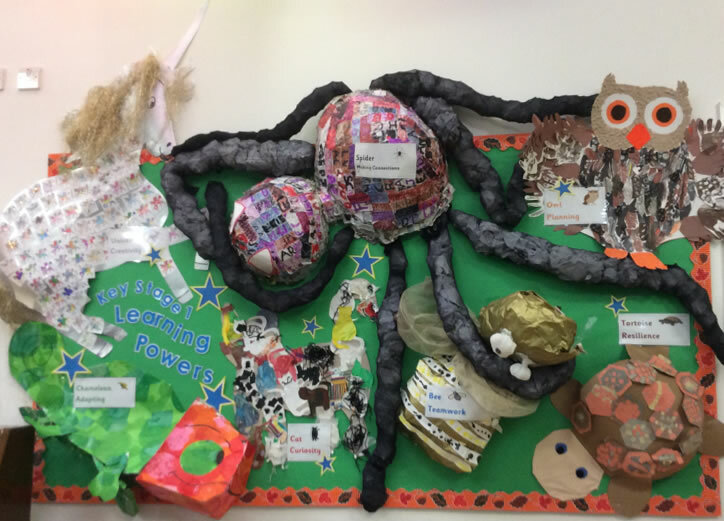 Since learning about the powers, we are striving to try our best with our learning and are very excited if we receive the ELLI award in assembly on a Friday for showing one of the learning skills in an amazing way.